‘Cave of the Hands’, Santa Cruz, Argentina. Archaeological evidence suggests that shamanic practices possibly had their origin in the early Palaeolithic (Clottes, J. 2008) with indications of Mesolithic shamanism in Israel with Natufian Culture shamanic burials. The likely conclusion is that the “…origins of shamanism are hidden deep in the mists of our primordial past.” (Pearson, 2002). 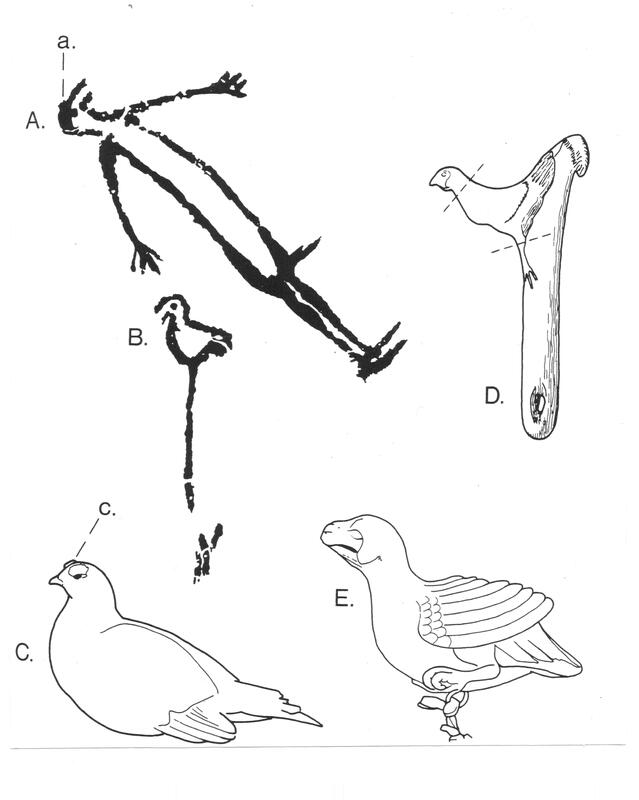 Further suggestions of proof are the presence of horned men in pictographs and cave art, with anthropomorphic birds and ornithomorphic men and women (Balzer, 1996). 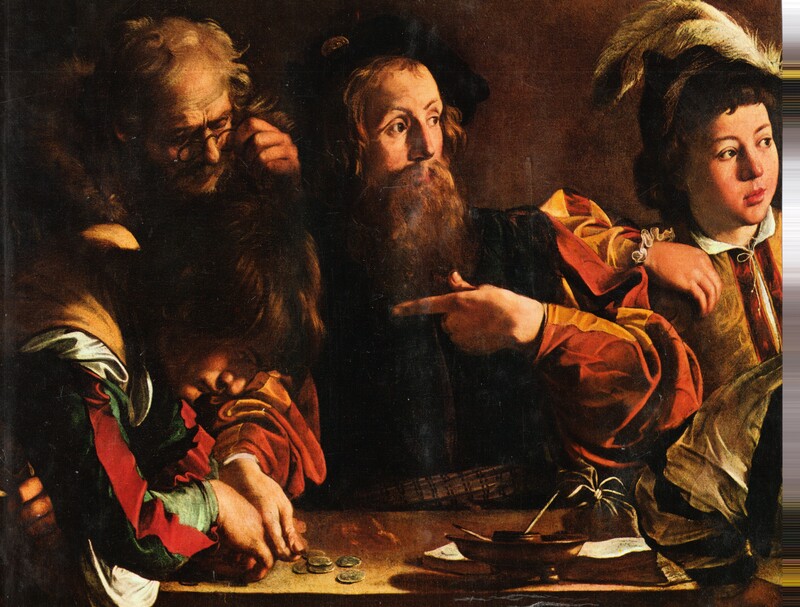 Indeed, in terms of antiquity, it has been said that a shaman is probably “…the oldest profession, covering the roles which in industrial societies, are played separately by the doctor, the psychotherapist, soldier, fortune-teller, priest and politician.” (Vitebsky, 1995). 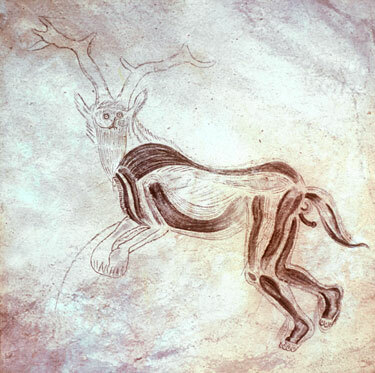 A large amount of Franco-Cantabrian cave art is shamanistic and “…produced by shamans and derived from their modes of thought.” (Lommel, 1966), therefore archaeologically cave art includes images that can be called shamanistic. Basque myths from the region are concerned with ghosts, shamans, red bulls, cows, horses, birds and snakes (Lommel, 1966), and significant are the half human half animal spirits. The female is Mari, male spirits are Maide and associated with female Lamin, thus Mari and Lamin are “…probably preserved characteristics of the more ancient Mistress of the Beasts.” (Lommel, 1966). Thus the consideration that the “…repetitively portrayed Palaeolithic ‘sorcerers’ and ‘shamans’ were divine owners of animals and forests.” (Gimbutas, 2001). Cave imagery is a palimpsest resulting from changing exploitation of the topography coupled with changing shamanistic beliefs and social relations (Lewis-Williams, 1997; Clottes, 1996), implying Upper Palaeolithic people “…did not adhere rigidly to set formulae.” (Lewis-Williams, 1997). Thus as the Upper Palaeolithic progressed the historically and geographically situated forms of shamanism changed. 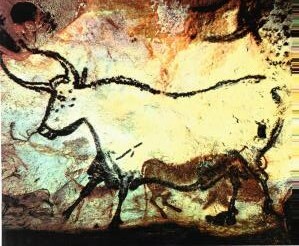 In order to understand shamanic cave art it is best to look in more detail at two examples – the so-called ‘sorcerer’ in the Sanctuary at Les Trois Freres, and the ‘Man and Bison’ composition in the Shaft at Lascaux. The ‘Sorcerer’ has an antlered deer head and hide who appears to be leading a dance to secure success in hunting (Lewis, 1969). 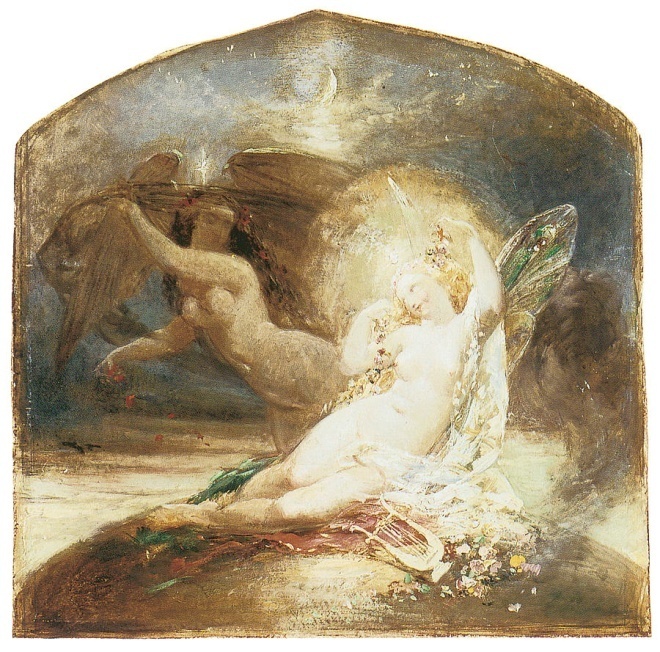 The image is of a masked human being to endow a unique, magical or religious act with greater permanence by means of pictorial recapitulation (Lissner, 1961). The unreal atmosphere is compounded by the half human half animal that is engraved and painted in an innermost recess of the complex Ariege cave (Grazioli, 1960), implying the ‘sorcerer’ is a mystical being. The painting is of a powerfully symbolic magico-religious ritual. The shaman is harnessing a group effort through group ritual dance to objectify the killing of an animal (Lewis, 1969). This shaman at Lourdes, wearing a tail and a beard, can be compared to Tungus shamanic portrayals because “…the adoption of several animal characteristics is throught to increase a shaman’s chances of sending hi soul on its travels…” (Lissner, 1961). The Magdalenian painted ‘sorcerer’ at Trois Freres, Ariege, France. The shaman requires maximum assistance from various animals while on his journey. He therefore wears a deer mask, owls eyes, wolf’s ears, horse’s tail, and bears paws, as well as dancing (Lissner, 1961). Among circumpolar peoples deer antlers and bears feet are the most effective in magical equipment (Ucko, 1967). 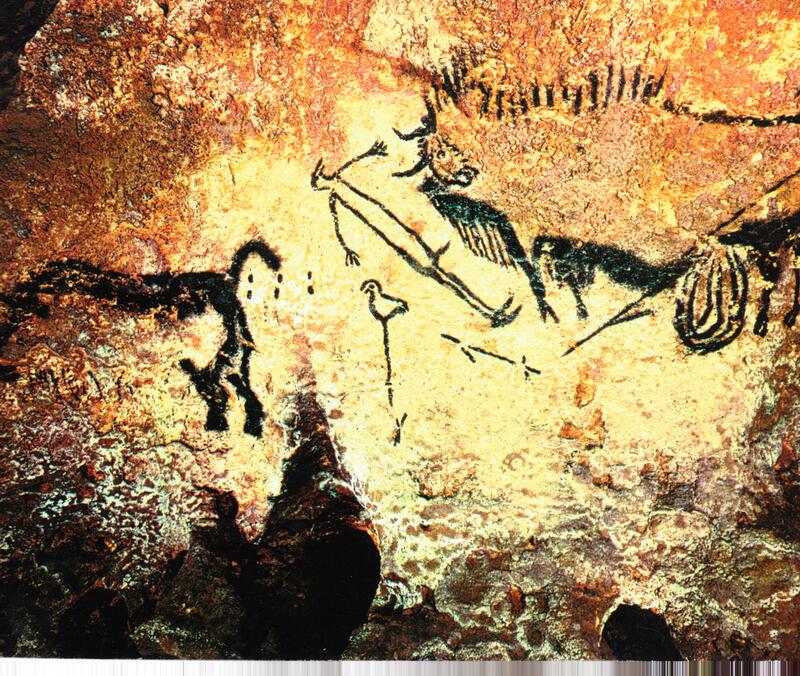 The ‘man with a bison’ in the Shaft at Lascaux is a shamanic scene with a sacrificial bison and an outstretched man (with a bird mask) lying on the ground in a trance (Lissner, 1961). The rhinoceros in the composition is insignificant because it is the man and bison in confrontation (Blanc, 1949). The supine figure is the shaman and the bird his tutelary spirit, and its perch a grave stick or sky-pole. The wooden bird poles symbolise a shaman’s spiritual journey and is thus “…a path to heaven symbolised by an upright pole and the belief that a bird can carry a shaman’s soul into the sky.” (Lissner, 1961). The whole is a complex composition that contains evidence of totemic belief, shamanic practice, and fertility ritual. A man in a bird’s head mask attacked by a wounded bison (?). The cave painting at Lascaux, France, circa 15.000 t0 10,000 BC. (shown above), can be explained by Siberian legends of modern times. A spear seems to have pierced the bison and eviscerated it. The shaman sends his soul to heaven while he lies as though dead (Lommel, 1966), as he hunts animal spirits of negotiates with the Mistress of the Animals. A number of factors indicate the shamanic nature of the composition. The bird is gallinaceous or grouse-like and resembles the grouse carving on a spear-thrower from Le Mas d’Azil (Davenport, 1988). The feet are humanoid, as is the phallus, but the hands are four-toed typical of a bird, and as such a pictographic symbol. The artist has portrayed the shaman as his spirit helper (the bird-headed wand) at the moment of his transformation or shape-shift into a Black Grouse or Capercaille (Davenport, 1988), a performance quite familiar to the Palaeolithic hunter, resembling the communal dances, strutting and ritualised fighting of the Blackcock. The secret of successful hunting is mimicry (Lommel, 1966), and a successful expedition is envisioned by the shaman beforehand. The entrails of the bison are wrenched out by a barbed spear and the whole image means for Abbre Breuil (1965) the hunter is wounded by the bison and then killed by the rhinoceros, whereas for Leroi-Gourhan the man is dying from wounds inflicted by the bison (Lissner, 1961). However, the shaman is most likely in a trance state. rock art in South Africa is historical evidence for ceremonies and roles of trance plus hallucinogens, so perhaps “…decorated caves in Palaeolithic Europe, at the end of the last Ice Age, might also reflect shamanic practices and trance ceremonies.” (Pitts, 2001). In addition, shamanistic practices among early Celtic divinations they wore cloaks of birds feathers as Siberians did, bearing in mind the Celtic belief in metamorphosis – shape-shifting – or ability to change shape or appearance at will. At Santander there are wall engravings of men in bird masks who seem to be dancing, and the bird-men of Altamira are also shamans, as are the masked figures at Les Combarelles (Lissner, 1961). At Teyat, Abri Mege (Dordogne) three strange figures resembling sea horses are probably shamans dancing in ibex masks. There are further examples of hybrid figures as hunters or shamans occupying territory between the human and animal world (Grazioli, 1960). There is also comparative evidence for shamans using birds as tutelary spirits or spirit helpers for shamanic ritual (Davenport, 1988), for example the Lascaux ‘man and bison’. Palaeolithic batons or ‘wands’ may be shamans drumsticks, and certainly more than items of everyday use (Lissner, 1961), and female statuettes are the earliest known figurative representations in the world and may have a shamanic ritual role as auxiliary dolls. 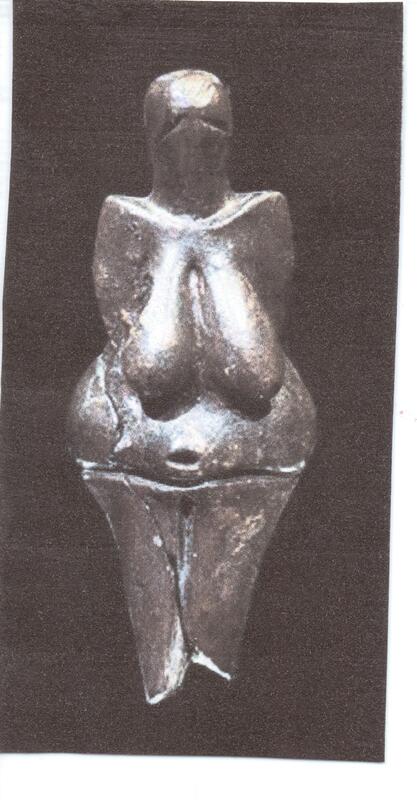 The female statuettes of Siberian tribes, who often had female shamans or ‘shamankas’, may have had a ritual role. At Ma’lta, 50 miles north of Irkutsk, female figures and birds carved in bone represent duck and geese, reminiscent of bird figures which modern Siberian tribes place on top of their shamanic sky-poles. In view of the fact that shamanic mobiliary art may not have been durable – wands, sky-poles, drums, and other equipment such as masks – it is nonetheless possible that portable engravings of birds may have had a ritual and shamanic role. The ‘man and the bison’ of the Shaft at Lascaux. The antiquity and ubiquity of shamanism implies it was practised by hunter-gatherers of the European Upper Palaeolithic (Lewis-Williams, 2002), but it was not static or unchanging across western Europe during 30,000 years, indeed “…shamanism is the most archaic form of magico-religious relation of man towards himself and his surroundings.” (Wiercinski, 1989). Indeed, in terms of prehistory shamanism is “…generally regarded as having been endemic to hunter-gatherer societies, because of the importance of its role in hunting.” (Aldhouse-Green, 2005). Upper Palaeolithic people associated logically consistent concepts to their cave painting (Lommel, 1966), thus prehistoric man attempted to integrate into life surrounding him by performing symbolic actions that included mimicry, dance and vocalisations. Hunter-gatherers of the Upper Palaeolithic had specialists, or shamans, whose authority and prestige permitted them to mediate between the surrounding natural and supernatural powers and their own people (Sandars, 1968). As a global phenomenon shamanism was by hunter-gatherers for thousands of years implying “…it is reasonable to infer that shamanic practices must in some way, be reflected in the material record (Pearson, 2002). Not only is shamanism attested archaeologically but also Palaeolithic art was thus “…the particular expression of shamanic cosmology and social relations as it existed at a given time and in a given period.” (Lewis-Williams, 1997). The prevalence of art deep within caves is the “…cornerstone of the totemic and the magical interpretations.” (Ucko, 1967), that deals the death blow to ‘art for art’s sake’ theories. The Palaeolithic cave artist therefore “…does not differentiate his aesthetic activity…in a world of mystic perception which is one single unity.” (Read, 1949). There are two reasons to assume that Upper Palaeolithic shamanism existed (Lewis-Williams, 1997) which are: (1) the ubiquity of hunter-gatherer shamanism; (2) the ability of the human system to achieve altered states of consciousness. Despite the worldwide similarities of shamanism (Eliade, 1972; Vitebsky, 1995) it is therefore probable “…that some form of shamanism – not necessarily identical to any ethnographically or historically recorded type of shamanism – was practised by hunter-gatherers of Upper Palaeolithic Europe.” (Lewis-Williams, 1997). It was hunter-gatherers who created much of rock art which they associated with shamanistic practices and the “…phenomena experienced by shamans during altered states of consciousness, are also reflected in rock art.” (Pearson, 2002). Indeed Siberian petroglyphs resemble the Aurignacian drawings from Palaeolithic France that me function as fertility symbols. However, caution has to be exercised when considering “…oven-ready shamanistic/ASC interpretations is being applied automatically to the wall art in everything to passage graves to Catal Hayuk.” (Bahn, 1998). 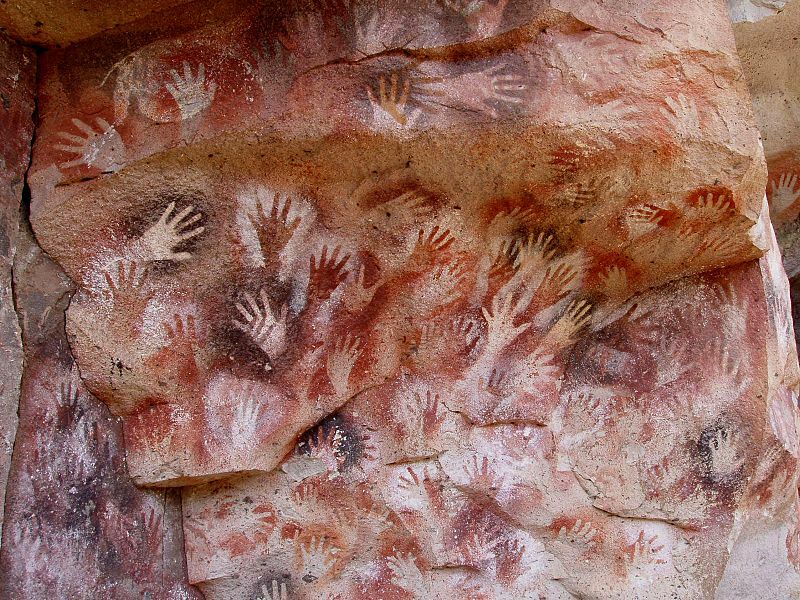 Handprints and footprints in cave and rock art have been assumed to be a means of establishing “…a bond between the person, the rock veil, and the supernatural world that seethed beneath it.” (Clottes, 1998). In general it is believed that Palaeolithic people saw cave entrances as portals to s supernatural domain, because rocks were assumed inhabited and protected by spirit entities. 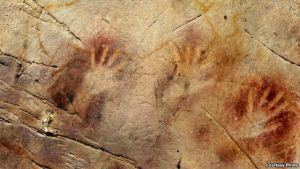 Handprints in a cave in Cantabria, Spain. 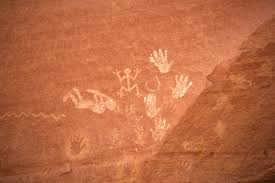 There are many examples of negative handprints, including Canjon de Chelly in northern Arizona, as well as positive and engraved handprints shown by Comanche Springs, New Mexico. The use of red pigment for handprints and paintings is assumed to represent the colour as a “…universal symbol of blood, which has always been regarded as the carrier of the life-force (Okladnikov, 1969). Small dimension human footprints are also a common feature of rock art and have been regarded as those of small ‘spirit helpers’, sometimes called ‘water babies’, who inhabited pools, springs and rocks. Many of the images and themes in Palaeolithic rock art have been described as shamanic, representing ‘magical flight’ (Eliade, 1964), and the ‘shamanic journey’ (Harner, 1981). 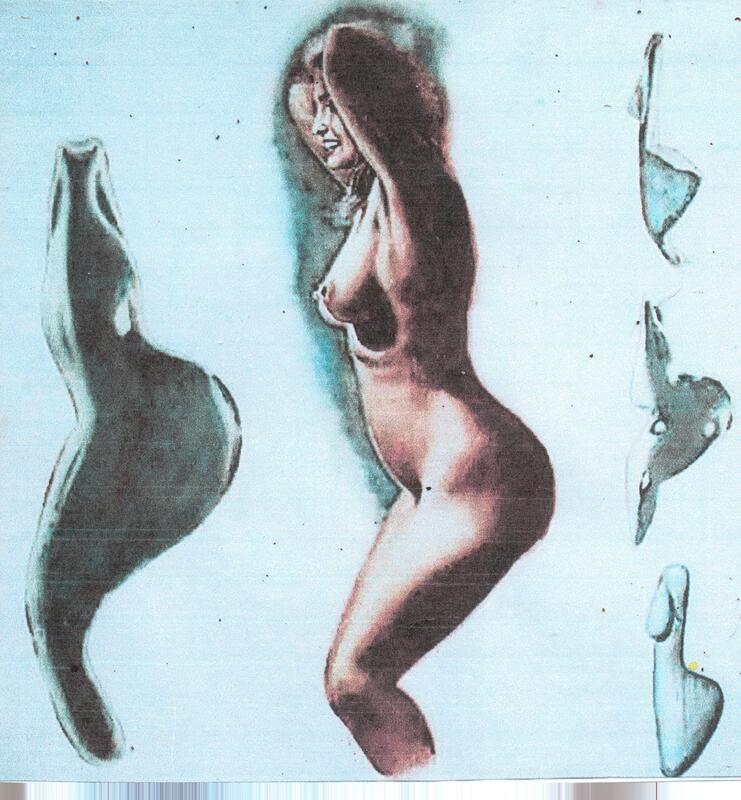 In this sense the flight represents an altered state of consciousness (Pearson, 2002), and is depicted in rock art. 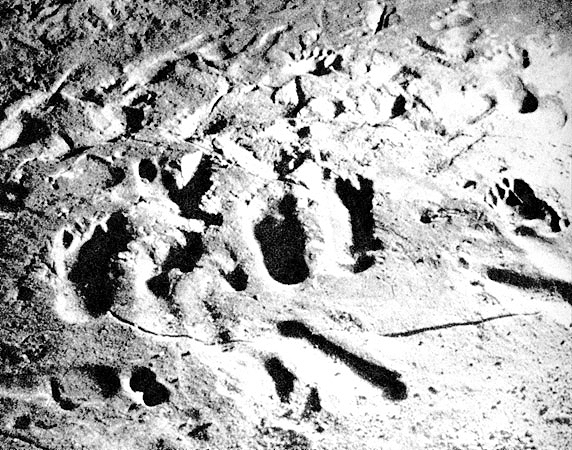 Magdalenian cave footprints, Ariege, France. 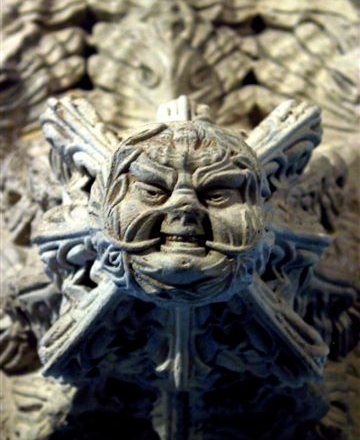 Entoptic motifs (behind the eye) in trance states include flecks, lines, waves, zig-zags, spirals and dots, however in the ensuing stage of ASC the shaman begins “…to construe these entoptics into meaningful representational images based on cultural beliefs and expectations.” (Pearson, 2002). Many of the prehistoric interments found in Siberia contain sophisticated artefacts (Artamanov, 1965). The petroglyphs found are ancient rock drawings done in red ochre and their distribution indicates “…communication or commonality of some kind among the nomadic northern tribes over the wide region from the Baltic to the far east.” (Okladnikov, 1969). 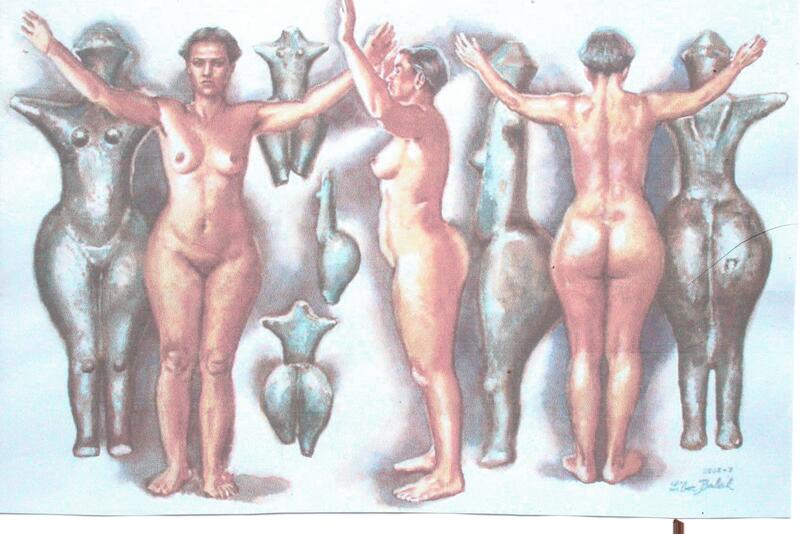 There has been much interest generated by rock art studies and shamanism since the 1950’s and 1960’s (Kuhn. 1956). Accompanying the revival interpretation in the art of the Upper Palaeolithic (Lewis-Williams, 1998; Clottes, 1996) has led unfortunately to “…certain scholars basing themselves on distorted ethnography, dubious psychology and a huge amount of assumption and wishful thinking, are interpreting rock and cave art exclusively in terms of supposed shamanism, entopics (i.e. trance imagery) and altered states of consciousness (ASC).” (Bahn, 1998). Aldhouse-Green, M. & S. (2005). The Quest for the Shaman. Thames & Hudson, London. Balzer, M. M. (1996). Shamanism. In: Encyclopaedia of Cultural Anthropology. Lewinson, D. & Ember, M. eds. Henry Holt, New York. Clottes, J. (2008). Shamanism in Prehistory. Bradshaw Foundation. Narby, J. & Huxley, F. eds. (2001). Shamans Through Time. Thames & Hudson, London. Pearson, J. L. (2002). Shamanism and the Ancient Mind. Altamira Press, USA. Vitebsky, P. (1995). The Shaman. Macmillan, London.